There is no better way to tour Manila than on a bicycle. Not only will you get to see everything up close and personal, but you'll be able to meet some of the locals and experience things you would normally miss if you were touring in a car or tour bus. 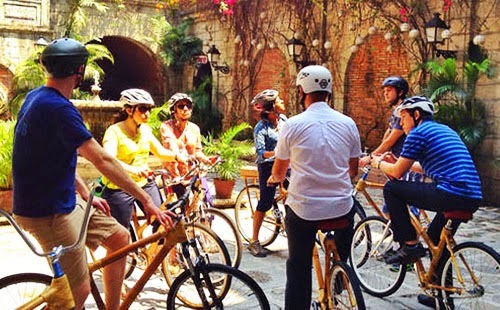 #1 - Bambike Ecotours: This company will take you to explore Intramuros, a very historical site in the Philippines that pertains to the country’s Spanish colonization era – when it got conquered for more than 300 years. You will ride a bambike, which is a hand-made bike made from bamboo. And you will get a very friendly tour guide who will tell stories about these significant ruins, and answer any questions you may have. #2 - Smokey Tours Bike Tour: See the other side of Manila through the Smokey Tours Bike Tour. The Philippines, though abounding with so many beautiful natural resources, also has some tough predicament. You can hear stories about people in the slums, market and the hustle and bustle of life in Manila – from your very courteous and amiable tour guide from this company. Sign up now and get to taste Filipino life, even just for half a day – especially how despite their simple living, these Filipinos can look happy and content. Humbling indeed! #3 - Filipino Travel Center: This company will take you on a mountain biking tour through the only remaining forest in Metro Manila. Bring a friend or two, or better yet, your whole family or group, to relish exercising via cycling amidst different plant species, trees, birds and insects –full of fun on a 40-kilometer stretch of trail.